Start the route at the church square in Vilallonga de Ter, R96 sign. Walk up the street that leads to the town hall and climb up the steep path that leaves the village, following the white and yellow marks of a PR. Walk below the big “Quer” farm and enjoy a spectacular view of the v alley and Vilallonga. As you gain altitude the wide path becomes narrower. Higher up you can see the village of Tregurà. After a steep climb, the path reaches a crossroads where there is an electric fence wire. Pay attention at this point and do not cross the fence even though there are yellow marks on the other side. You must go left following a channel camouflaged by grass.The wide path goes into a forest of birches until almost reaching the farm of “La Riba”. Cross some meadows above the farm and right in front of you stands the neighbourhood of Llebro. Descend to find a stream, cross it, and walk upwards to Llebro. Exit the neighbourhood by leaving the last house behind and walk uphill through old winding paths. After walking for a good while uphill you arrive at an open area, “El Serrat de Sant Martí”. At this point you must be careful as you must leave the wide trail to take a narrow path to the left. The path crosses a stream and a dammed area, where there are troughs, and goes directly to the plain of “La Rovirassa” underneath the “Nen del Llabro” rock. 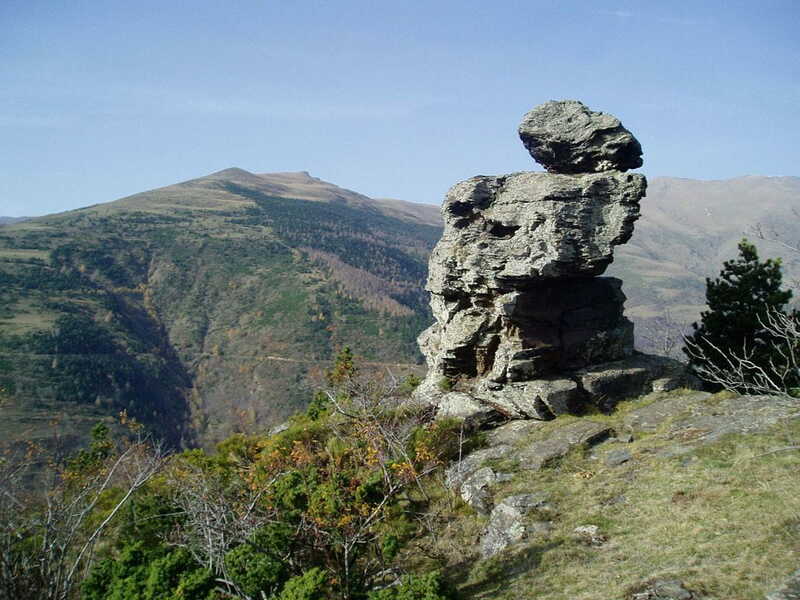 It is worth to get closer to the curiousrock as its shape looks like a human figure. Continue the route walking on a path that climbs through a forest to an open area known as “Clotegalls del Morral”. In this area of rock debris, there were cattle herder huts, nowadays partially in ruins. Walk downhill while crossing some meadows and with the town of Setcases at the bottom of the valley surrounded by a circle of high mountains. You will arrive at a crossroads, where any of the two paths marked with green and white signs will lead you to Setcases. In case of spare time, an alternative is to follow the path that begins right in front of you. It goes through Bedouin fields and next to the cottage of Socarrats with beautiful views of Setcases. If you take this trail, the route extends about _ of an hour. The shortest option proposed by this route is to follow the signs on your left that in a dizzying descent through a forest will lead you to the main road in twenty minutes. Stay on the road and walk towards Setcases where after crossing the river Ter you will find the R102 sign Pont Vell, the end of route.